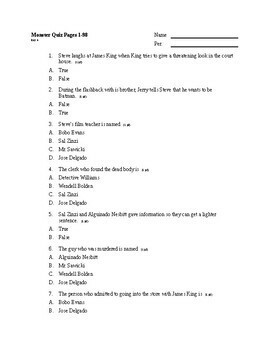 This document contains three separate quizzes/tests on the novel Monster. The first is a 10 question quiz on pages 1-98. The second is a 10 question quiz on pages 1-136. The third is a 31 question final test on the entire novel. The quizzes/tests are made up of multiple choice, matching, multiple option, true/false, and short answer questions. I also have a unit on Monster on TpT, which includes questions and activities for the novel as well as these tests.